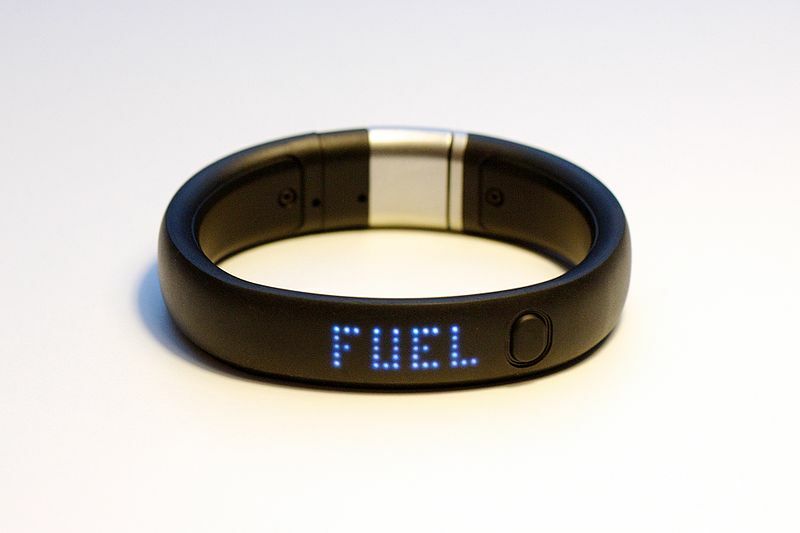 A scant two years after Nike launched the FuelBand – a fitness tracker designed to be worn on the wrist and used in conjunction with a smartphone like the iPhone – rumours are rampant that the mega-sports brand is shutting down the FuelBand hardware division and ceasing production of any future FuelBand models. This is (if the rumours prove true) a dramatic turn of events in the nascent wearables industry. Wearables are by far the hottest category in the consumer electronics space and it has seen massive expansion since getting its first mainstream products three years ago when FitBit released its FitBit One, the first activity tracker that used Bluetooth as its syncing technology (previous models required a manual connection for charging and sync). Now the field has many more players including Samsung, Polar, Nike, Jawbone, Google, TomTom, Motorola, and it goes well beyond single-focus of activity tracking. So if wearables are so hot, why has Nike decided to cede the race so early in the game? Perhaps there is a lesson to be learned from two other tech races. Remember Flip Video? After its debut in 2007, the tiny solid-state memory-only camcorder went on to capture 13% of the camcorder market, at least as far as Amazon.com sales were concerned. It also inspired a whole wave of imitators with everyone from Sony to Toshiba to Samsung joining the fray. Then, less than two years after Cisco bought Flip Video’s parent company for $590 million, they abruptly shuttered the entire business, leaving fans and industry watchers alike scratching their heads. While Cisco never offered a concrete explanation for their decision (other than the desire to focus on their core business) the prevailing belief at the time was that pocket-cam market share had already reached its zenith and would soon see slow but steady attrition thanks to the increasing ubiquity of high-quality video cameras in cellphones. In hindsight, this has proven mostly true as the camcorder industry as a whole has been attacked on two sides (the smartphone and the inclusion of video capture in high-end dSLRs). Could it be that Nike has seen a similar fate on the horizon for fitness trackers and decided to get out now, before the impending bloodbath? Even though analyses of the failure of Waterloo’s favourite business have become more common than hipsters at the local fair-trade coffee shop, it’s worth taking another look at BlackBerry’s trajectory in the context of the wearables industry. The current conventional wisdom on the subject goes something like this: BlackBerry started with a killer product. It grew like crazy until Apple came along and launched a product with a similar set of capabilities but in a far more consumer-friendly package. Apple then doubled-down on their success by developing an ecosystem around the iPhone that remains the envy of the industry to this day. Meanwhile, believing that they simply needed to take a few pages from Apple’s (ahem) playbook, BlackBerry tried to jazz up their product line with tablets and new smartphones with a more consumer-y feel to them. This new direction, as logical as it was, has failed to reverse the company’s hardware business. The latest rumours suggest that BlackBerry, under new leadership, will finally give up on trying to please average consumers and focus once more on the enterprise – and mostly from a software perspective. Could it be that Nike sees the wearables hardware space as one that will ultimately be dominated by companies like Samsung and Apple, and has chosen to quit the business before they get handed their defeat by these tech giants? There is of course, a third possibility. But if you’re a fan of fitness trackers you might not like this one at all. What if the whole fitness/activity tracker thing is a fad? I’ve used the FuelBand. I wore one for a month after its Canadian launch. Like many other users, I was initially obsessed with my Fuel points and steps taken and calories burned and I enjoyed watching the companion app on my iPhone keep a running tally of these stats. I also enjoyed the celebratory animation whenever I reached my pre-determined daily activity goal. But then I stopped caring. I quickly learned that on the days that I went to the gym, I would achieve my goal. The days that were spent only going to work and back and doing normal activities, would only get me about 50 per cent of the way. So why did I need to keep wearing and syncing and charging the FuelBand? I now knew exactly what it would take for me to maintain a certain level of activity (as if I didn’t already know), which as far as I was concerned, was the only real reason to wear the FuelBand. Last year, I was sent a demo of the Polar Loop, a virtually identical product to the FuelBand. Thinking perhaps I hadn’t given the FuelBand a decent try, I began using the Loop. My experience was no different. As soon as I learned what kind of day would yield me the activity level I desired, I stopped caring what the Loop had to say. Maybe I lack the competitive urge to gradually increase my activity goals and then strive to meet them, regardless of the reality of my daily schedule. Perhaps I’d be more interested if these products tracked other stats such as sleep patterns which the FitBit Flex is designed to do. Or maybe, our interest in these gadgets is merely a by-product of our curiosity. It’s the first time we’ve been able to strap a small device to our bodies and learn about the numbers that describe what we’re up to in the real world and we’re keen to hear that story… at least for the first few tellings. Ultimately, I just don’t think that the current batch of activity trackers offer enough value to the average person to warrant the expense and maintenance of owning yet another gadget. True fitness buffs are of course a different breed. But they are also a niche. A fairly small one at that. And Nike, just like every other major marketing machine, isn’t interested in niche. It wants the mass. According to NPD, the entire tracker market was only worth $330 million in 2013. Nike’s share? Just 10 per cent. So whether Nike thinks its FuelBand runs the risk of becoming a BlackBerry when other, more experienced consumer tech companies jump into the segment, or they think that newer devices will squeeze pure-play trackers out of the market, or they’ve acknowledged that it’s only ever going to interest a niche audience, leaving the hardware race might just be the smartest move they can make.